This is the 3rd and final card I made for Regionals. This was my favorite one. I love the colors and the flower is just so cute. I started this card out as an ATC. The Peach Parfait and Cajun Craze look so good together. Then I added Not Quite Navy for an added POP. I had to dye the White Satin ribbon with re-inker because SU! doesn't have the ribbon in Not Quite Navy. I used the stamp set called Hola de Nuevo for the sentiment. I will be sharing Regional swaps for the next couple of weeks. I made over 150 items to swap. So that means I have over 150 items to share with you. Well, I may have less because I did give out some of my items to stampers that didn't make swaps. This is the other 3-D item I made to swap. I used Soft Suede, Regal Rose and Whisper White card stock. 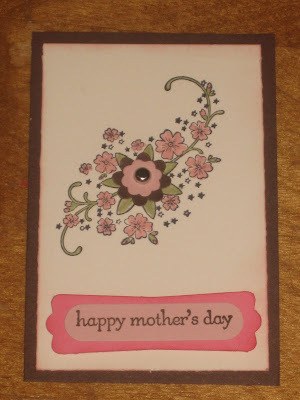 I used three punches; the Scallop Oval, Modern Label, and Pinking Hearts Border Punch. I filled the Small Cello bags with M&M's and attached a Help Whip Cancer Pin to the topper. The pin is from The Pampered Chef. I bought them about 6 years ago when I was a Consultant. These are the pins that I put in the box I shared yesterday. My sentiment came from the stamp set called Eat Chocolate.